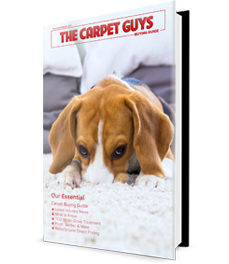 Carpet Guys > Blog > What is Carpet Density? A carpet density rating is one of the factors that determine how well your carpeting will perform. Simply put, carpet density numbers refer to how close together the fibers of your carpet are tufted into the backing. Density is often misconceived as a carpet’s face weight, but these two terms are completely different. Face weight does come into play when you are calculating density, however. Fiber height is the length of each carpet fiber from the backing to the tip of the strand itself. In the formula above, we represent the pile height as a fraction of an inch. The number you’ll get from the formula will be a four-digit number. If you’re trying to figure out the density to gauge the quality of your carpeting, don’t use this number alone. The density, face weight, twist, and fiber type number all play a part in quality. Each of those factors is important to keep in mind when selecting the type of carpet you want to get installed. Higher density carpets tend to be more durable, however. It’s not a necessity to go through all this math when you have a local carpet company that does it for you. Don’t stress out about checking every carpet density number of carpet samples galore. We have that information for you. Give The Carpet Guys a call and get a free carpet estimate to make buying carpeting an easy a stress-free process. We have you and your floors covered.